1. 4 pounds cucumbers, peeled, sliced thin. 2. 1 1/2 pound onions, peeled, sliced thin. 3. 1 pound tomatoes, cut julienne. 8. 1/4 cup parsley, chopped. 10. 25 iceberg lettuce cups. 11. 1/3 cup chopped parsley. 1. 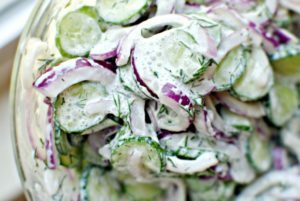 Place the cucumbers, onions and tomatoes in a mixing container, toss gently. 2. Add the vinegar, sour cream, water, salt, and mayonnaise. Blend thoroughly. 3. Cover and let marinate in the refrigerator for at least 2 hours before serving. 4. Line each cold salad plate with a crisp iceberg lettuce cup. 5. Place a mound of the salad in the center of each lettuce cup. Garnish with chopped parsley. 6. Serve with a sprig of parsley. 1. 5 pounds carrots, peeled, grated coarse. 5. 1 teaspoon vinegar, cider. 8. 25 iceberg lettuce cups. 1. Place the raisins, water, sugar and vinegar in a sauce pan, bring to a boil, remove from the range and let set for 5 minutes, drain thoroughly and let cool. 2. 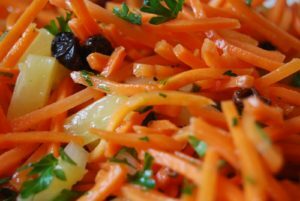 Place the carrots and raisins in a mixing container. 3 Blend together the mayonnaise and French dressing. Pour over the carrot-raisin mixture, toss, until all ingredients are thoroughly blended. 4. Line each cold salad plate with a crisp cup of iceberg lettuce. 5. Place a mound of the salad in the center of each lettuce cup. Garnish with a sprig of parsley.